Margherita Pizza is a pizza made for a Queen (literally); it was created by Don Raffaele Esposito, tthe owner of Pietro Il Pizzaiolo a famous pizzeria during thatt time. He was tasked to prepare a special dish for Queen Margherita Teresa Giovanni during her visit in Naples during 1889. The ingredients was well thought off which resulted to symbolize the Italian Flag where the ingredients used matched all the colours, red (tomato), white (mozzarella) and green (basil). 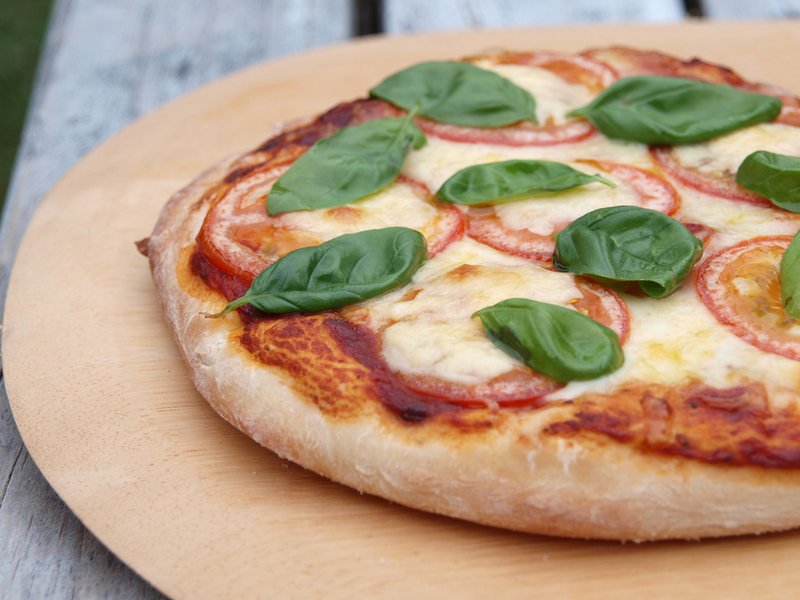 A really simple pizza and in fact one of the most basic ones but I will certainly beat the flavours of some intricately flavoured pizza versions once done right. My secret is good dough, lots of mozzarella, good quality tomatoes, fresh basil and lots of love and passion for cooking. How about you do you know any simple dishes that do taste really good, if you do please post you link here and I would love to try them. Place your toppings brushing the dough with olive oil initially, then with the tomato puree mix, mozzarella cheese, parmesan cheese and tomato slices. Let it rest for 15 minutes. Ok, now I’m hungry for pizza! This looks absolutely perfect. One of my favorites and now I know the story behind it! The pizza crust looks crunchy and oh my it looks delicious! The plenty of cheese on top is so tempting and lovely color. Now that’s one gorgeous pizza. I wouldn’t mind eating a few slices right now. 🙂 Thanks for the background story–too cool! Mmmm, my very favorite! I like to make a non-traditional addition of roasted red peppers on my margaritas… goes great with the mozz and basil! Margherita is always my favorite! So glad I found that! Will definitely try!